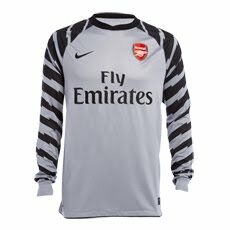 As Almunia palmed the ball into his own net and Flappyhandski slapped it against Titus Bramble's head in the final games of last season the thing we were all sure about was the arrival of a new keeper. Arsene had no idea who was number 1 as they were both number 2s. The defenders had no idea who would be behind them from one game to the next. We had no idea how many mistakes we would see. They had no idea. It's Friday the 13th and the new season kicks off tomorrow and we still don't have the most obvious of problems sorted. Twitter was hot last night with quotes from Schwarzer about how he would pay his own taxi fare to play for us but I'm too long in the tooth to believe anything until I see a new man in the famous grey with zebra arms shirt. To not address this problem is neglect. At any level of football a decent keeper is essential. I've been lucky enough to run school football teams at a very small school. I often have very few players to choose from and rarely am I lucky enough to have a good goalkeeper but if I do results improve enormously. The whole team is more confident. I believe this is true from schools football right up to international level. Just look at England in the summer. You will win nothing with a poor keeper. To be honest for the first time ever I'm not really looking forward to the season starting. I think I must be mentally scared by the goalkeeping I saw last season. I pay too much to see mistake after mistake by the keepers again. I really do feel that we are damaging our chances of winning anything or even finishing top 4 if we stick with either of them. They need to move on. A fresh club would be good for them as well as Arsenal. Another season of that and it could destroy the pair. Ship them out for their own good if nothing else. Of course it's not just the keepers that are our weakness. It's the defence too and it looks a little weaker than last year. This needs addressing too because I'm guessing we will get injuries! This has turned into a bit of a moan. I'm sorry! Typical football fan - never happy. Well we look ready in midfield and up front going forward. Goals will not be a problem but we need these boys to defend as a team too. Sorry, used that 'D' word again but it does all come back to that. The 'we will just score more than you' method might sound fun but we will soon be undone. So come on Arsene, find us that keeper and defender that could make all the difference. Friday the 13th - the perfect day to bury last season's nightmares. I worried myself by writing that but I really am worried by our defence. We can't carry any weak players. Too many teams looking capable of a top 4 finish for us to drop points due to goalie errors.